[ blog.danhett.com ]: Announcing... the Manchester Game Jam in February! 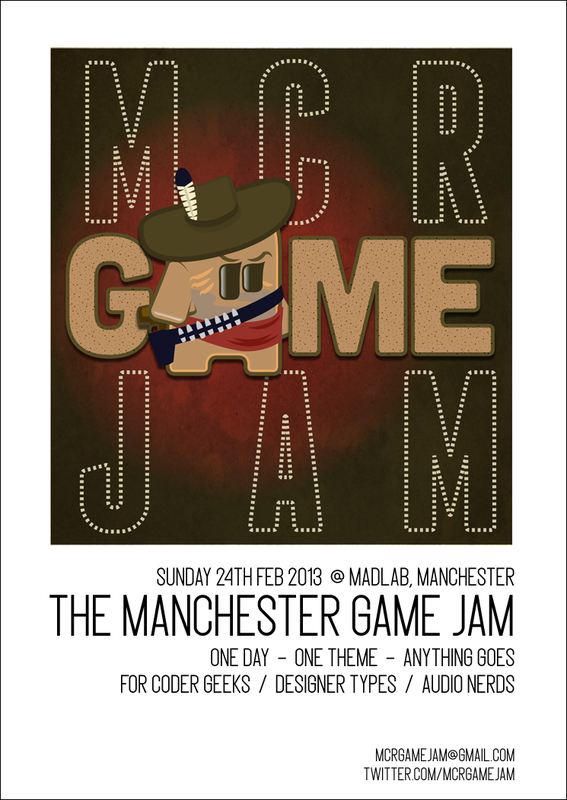 Announcing... the Manchester Game Jam in February! The Manchester Game Jam is baaaack! We'll be jamming once again at Madlab in Manchester for another one-day mini jam. It'll be the same format as before: one theme for everyone, anything goes. Last time round we made loads of party games, and at the jam before that we made games full of lasers. Lasers! We'll be announcing the theme a few days before the event, so everyone has some planning time, and both solo and group entries are both A-OK.
We're open as always to all manner of coders, designers, audio folk or just the plain game-curious. If you're interested in joining a group you can either let us know in advance, or we'll figure some groups out on the day. Not into videogames? That's fine too: in the past we've had teams create boardgames, pervasive games, games with cameras and games over live weblink to Berlin, so show us what you've got! Anyway, here's a lovely poster for you to print out and stick directly to your face, or failing that you can click here for some more info and here to buy a ticket. Oh, and feel free to give us a shout on twitter or drop us an email if you'd like to know more.